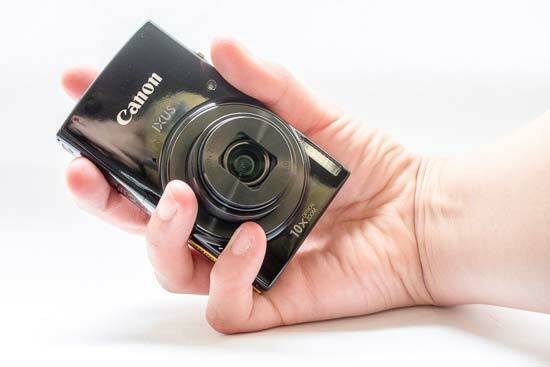 The Canon IXUS 190 is one of a duo of new IXUS cameras, the IXUS 185 and 190. They are the slimmest models in Canon’s range, making them ideal to slip into a pocket or bag. The two cameras are the same in every respect, except for the fact that the IXUS 190 features NFC as well as Wi-Fi, while the 185 is Wi-Fi only. If you have a smartphone or tablet which doesn’t feature NFC (such as an iPhone), you may as well plump for the 185. Both feature a 20 megapixel CCD image sensor, a 10x optical zoom offering an equivalent of 24-240mm in 35mm terms. 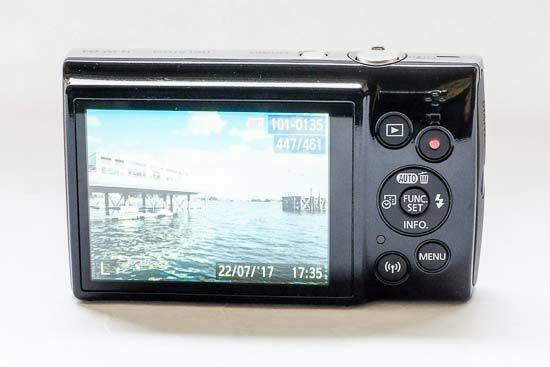 Other specifications include 720p HD video recording, a smart Auto setting, and a set of creative filters which can be applied to your images for different looks. 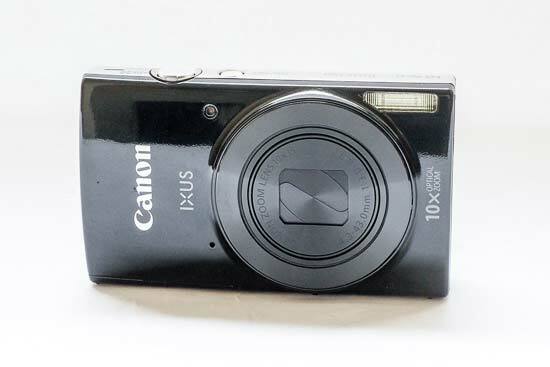 The Canon IXUS 190 is available in silver, blue or black with an RRP of £169.99 / €219.99. As it says in the marketing material of the Canon IXUS 190, the camera is indeed very slim. You shouldn’t have any trouble fitting this into a trouser or jean pocket, or a very small bag on a night out or similar. The camera is very light and is made from plastic, which leaves it having quite a cheap feel. Rounded corners and the black finish of the one we’ve been supplied with give the camera quite a sleek appearance to look at, though. On the top of the Canon IXUS 190 there’s the on/off button, along with the shutter release. Surrounding the shutter release is a zoom switch for extending and retracting the 10x optical zoom. It’s quite a small and fiddly zoom switch, but it feels relatively solidly built. The zoom itself moves in and out relatively quickly, with a slight pause before moving into the digital zoom territory. You’ll also see a zoom bar at the top of the screen, which will display yellow when you enter the digital zoom, and blue when you push the digital zoom even further. Moving to the back of the Canon IXUS 190, there’s quite a basic layout - something which you’ll be familiar with if you’ve ever used a Canon compact before. There’s a playback button just next to a dedicated video record button. A four way pad has a different function assigned to each directional key. The up directional key controls the different shooting modes available, the right key is for flash functions, the left key switches on and off the date/time stamp and the down key changes what is displayed on the screen. In the middle of the navigation pad is a function button, which you can use to bring up a quick menu (depending on your shooting mode). You can also use this button as a “confirmation” button when selecting options in the main or quick menu. The final two buttons are a menu button, for accessing the main menu, and a wi-fi button, which you can use to quickly set up a wi-fi connection to your smartphone or tablet. It’s fair to say that this camera is aimed towards a beginner audience, and as such, the default shooting mode is automatic. There’s also an “Easy Auto” mode, which can be set to automatically activate when you switch the camera on. Alternatively, if it’s switched off, you can switch the mode on by holding down the up directional key. This mode gives complete control to the camera and is ideal for those who just want a simple point-and-shoot type set up. With the standard auto setting, you still don’t have a great deal of control, but you’ll find a few different functions in the quick menu, including the size of image, drive mode and timer. For those that want to take a little bit more control, there’s a Program mode available. With this, you can change certain key parameters including ISO, exposure compensation and metering. More advanced controls, such as shutter speed and aperture can’t be set. You can also access creative filters through the program menu, as well as changing the focus mode (between Normal, Infinity and Macro). The Canon IXUS 190 has a 2.7-inch, 230k-dot screen. By modern standards, this is a very basic offering. When shooting in lower light conditions, the screen is marred by a strange colour cast. Occasionally, you might also see lines running down or across the screen. At times, it can be a little difficult to compose your image as it proves to be such a distraction. Additionally, the screen is not touch-sensitive. A door protects the battery and memory card compartment. This camera accepts SD/SDHC/SDXC cards, and has a rechargeable battery which you have to remove from the camera to charge (a charger is supplied in the box). 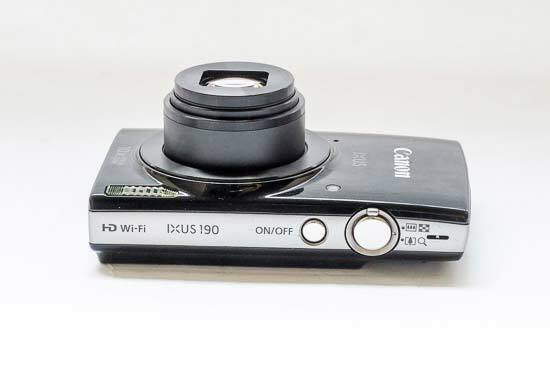 When it comes to autofocus, there’s no way to choose your own autofocus point, instead the Canon IXUS 190 will choose for you. You also can’t set it to centre focus and recompose - more advanced photographers may be disappointed to learn this, but for beginners it may not be too much of an issue. Most of the time, the camera will pick the “correct” autofocus point, but on occasion you may find you have to take the picture more than once, in order to get the focus point you require. Generally speaking, autofocus is relatively quick. In lower light conditions, you might find that the lens hunts a little in order to acquire focus. The odd false confirmation of focus is displayed, but it’s not too much hassle to refocus. Macro focusing can be switched on from the function menu when shooting in Program mode. Otherwise, it should be activated automatically when you get close to a subject. You can focus pretty closely, with the lens almost touching the subject itself on some occasions. Start-up time is pretty quick, being ready to focus and shoot within one second. Shot-to-shot time is a little on the slow side, with there being a noticeable pause between shots. If you want to take a lot of pictures in very quick succession, this may be quite annoying, but otherwise it’s probably not something you’ll notice all that much. Moving through photos is also a little on the slow side, when viewing images in playback.